Or how geeks can save the planet and millions of lives using near-term A.I. to make taxis and trucks deliver, park, recharge and drive themselves. For some time people have dreamed of a car that drives itself safely on the highway and city streets. While driving can often be a fun experience, Americans spend about 50 billion hours per year behind the wheel (total working hours are only 240 billion) -- and much of that is not productive or particularly pleasant. In the past, this idea has generally been considered to be science fiction. There are scientific, engineering and social obstacles to making it happen. In 2005, however, all that changed. Now many experts believe this technology is within our grasp, if we have the will to build it and embrace it. As soon as I realized that, I started researching the implications and found them to be astounding. "This nation should commit itself to achieving the goal, before the next decade is out, of a computer driving a man to lunch at noon and returning him safely to work." Indeed, I came to the conclusion that making self-driving "robot" cars, taxis and delivery vehicles ("robocars") is the most compelling short-term engineering problem on our current horizon, and easily the computer engineering project with the greatest potential near-term benefit. It is well worth an "Apollo" project -- to make it happen in a decade. In this essay, I'm going to try to convince you that this is something worth doing "not because it is easy, but because it is hard." That the result can be a saving of millions of lives, trillions of dollars and billions of hours, as well as one of the largest calculable reductions in pollution and greenhouse gas emissions. Robocars can make electric cars real and popular, eliminating the USA's dependence on foreign oil and the strife that causes. No small potatoes, and those numbers are not hyperbole. To top it off, robocars could rewrite the rules of durable goods, end congestion and parking problems and eventually reshape the city itself. The problem is not easy, and the goal of these essays is not to promise you robocars by a certain year. Rather, the goal is to outline how we might get there, and what it can mean if we do. If I can demonstrate a tremendous value, I hope this can start generating the will to make this happen. 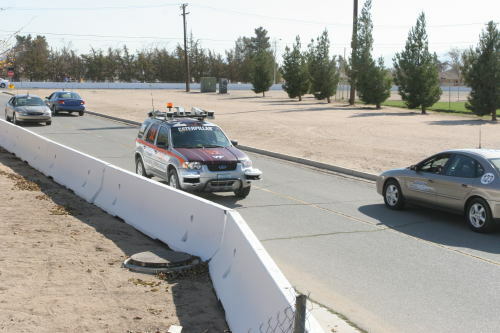 The field was jumpstarted by the DARPA Grand Challenge. DARPA is the military research agency, which has funded several worthwhile projects that became a success, including the initial internet. The Grand Challenge was a contest to produce self-driving vehicles. The military need for them is clear -- they want robot trucks that can move cargo through dangerous zones without human drivers. That way, if the trucks are attacked or blown up with roadside bombs, no soldier dies. But this military demand will trigger something of far greater value to general society. The first DARPA Grand Challenge contest was quite disappointing. Though many teams entered for a chance at the million dollar prize, none made it more than a few miles along the desert course. Most used very simple, GPS tracking technology. DARPA demanded that the teams do much better in their 2005 contest for $2M. Chump change to the military, chump change in the world of transportation, but enough incentive to get some talented and creative teams working hard. Just 18 months later, the results were astounding. 5 teams built vehicles able to navigate a 150 mile desert course at fairly high speed -- moving down winding roads, avoiding obstacles and even passing one another where needed. The designers were handed a map of the race course 4 hours before the race, loaded it into their cars and pushed the start button -- they had no contact with the cars during the race. A Google video of the first non-Google user of the car running errands in it;http://www.youtube.com/watch?v=cdgQpa1pUUE. See if you figure out the surprise. These vehicles are just prototypes, of course. They are not yet ready to put in the hands of ordinary customers. There is still more research and intense engineering to be done. But now the problem seems doable in a way it never was before. Watch these videos and they may make a believer out of you. In 2007 a new race was run. This time, vehicles would drive on city streets, following all rules of the road. They would recognize and obey traffic signs and even 4 way stops. They would yield to other vehicles, make proper left turns and follow lane stripes like any driver. The streets were filled with other cars driven by race officials. This time 6 teams finished the course within the time limit, with BOSS from CMU as the winner, and Stanford's Junior a close second. Some cars were flawed, and even made dangerous errors, with one fender-bender. But this was the very first attempt, and these were prototypes. The technology is definitely coming, but even more important is understanding why we must get there, the steps along that path, and what happens when we do. While DARPA has not held any other contests, progress has not stopped. The military is still very active (though it won't attain its goal of 1/3rd automated vehicles by 2015) but the big action is in the civilian space. Many of the best members of DARPA teams joined a team at Google to produce Robotic cars. The project was kept secret until October, 2010, and since then has made only a few specific announcements. At that time, they announced 140,000 miles of driving on city streets -- in April of 2014, they announced the number was up to 700,000 miles and it continues to grow quickly. I'll be discussing it more later, but they have also shown their latest prototype vehicle -- a custom designed car with no steering wheel, brakes or throttle which runs completely without human intervention. It's a small buggy that only goes 25 mph and runs on electricity, which seems like a step back from those many miles on the highways, but in fact it's a giant step forward. There are many robocar projects both at car companies and at academic labs. You can read a summary of various projects to get a sense of the scope of it. Car accidents kill about 34,000 people every year in the USA, and 1.2 million around the world. (This is down from a peak of 45,000, in part due to computerized safety technology.) They injure and maim millions more, and tear apart many more lives with grief, for these are all premature deaths, often among the young. Consider that number in context. That's just a bit fewer than the numbers who die of Alzheimer's and Influenza, and more than the death toll of kidney disease, infections and suicide. It's double the death toll of liver disease and hypertension and nearly triple that of homicide. It's more than most individual diseases and cancers. For young adults 15-34, of course, who do not fall nearly so often to heart disease or Alzheimer's, it the leading cause of death among the established categories. It's the 3rd largest cause of years of life lost. While a chance to reduce the death toll from human driving should be more than enough to convince you, accidents cause more than death and injury. They also clog roads, damage vehicles and require extensive emergency response systems. The NHTSA has attempted to quantify the total cost of accidents, though such numbers are always subject to debate. In 2000 they put it at $230 billion per year but in 2014 they revised their methodology and calculated $871 billion per year. Remarkably, that's around 29 cents/mile -- more than the cost of gasoline in most cars and trucks, and a major part of the GDP. More than the depreciation cost (ie. the cost of the car itself) for many cars. Numbers for motorcycles go up closer to a dollar per mile. A back of the envelope calculations suggests a global cost close to 4 trillion dollars, a number that's hard to grasp. The cost of accidents is arguably the single largest component of the per-mile cost of driving a vehicle. This is important because to be accepted, robocars must have a dramatically lower rate of accidents -- ideally as close to zero as possible. While no software system can every be truly free of bugs, because a "crash" here has a literal as well as metaphorical meaning, teams must work particularly hard. In addition, these technologies will arrive incrementally, in the form of "crash-resistant" cars which are still mostly driven by people. While these death numbers are the most compelling argument for robocars, we seem to have become so innure to the carnage that it may be the gasoline-saving consequences that you will see below will capture the imagination of the public even more. While the death toll is already sufficiently compelling, cars come with many other costs. Traffic congestion, caused by more than just accidents, wastes from 4 to 8 billion hours of people's time each year, and results in the burning of 6 billion gallons of extra fuel. Robocars will not eliminate congestion immediately, but as they grow to become a majority of cars on the road, they can do this in several ways I will outline below. Robocars need to stop somewhere when not in use, but they won't need parking right at your destination -- they will drop you off and then go elsewhere to work, refuel/recharge or park. When they do park they will be very efficient, like a tight valet parking lot. They may even block driveways and hydrants as they could quickly move on request. Single person robocars will park even more densely. Custom garages could do even better. Many people will use robocars as taxis, which means they won't park at all after dropping you off -- they'll head out to pick up their next fare. If you do own one, you probably won't need a garge -- it can find somewhere to wait nearby, or even hire itself out as a taxi to make money while you are not using it. Robocars could also refuel and recharge on their own. This turns out to be a remarkable enabler, because refueling stations need no longer be all that numerous or conveniently located. This enables new fuel types to be tried out in the market very quickly. As indicated, Americans drive some 3 trillion miles each year and spend at least 50 billion hours doing it. (This latter number is my own very rough estimate.) A robocar may eventually approach a level of mobile comfort similar to a train, with a nice seat, a wide desk, internet, a computer/TV and phone. This turns those hours into more productive, comfortable hours. At the national average salary of $37,000 per year (SSA) for a 2000-hour work year, I rate this time as worth roughly one trillion dollars per year. Of course, cars emit a great deal of pollution, and by some estimates, cause 30% of U.S. greenhouse gas emissions. What can robocars do about that? I'll describe that in more detail below -- but it turns out that they can be a great deal greener -- an order of magnitude greener in the cities. The robocar is interesting, and can provide a very nice transportation experience. But things get really interesting when you consider who will own the vehicle you ride in. Robocars that can operate unmanned enable robotaxis -- robocars for hire, which come to you on demand and take you directly, quickly and cheaply where you want to go. I envision the robotaxi coming from a cell phone hail. You'll use an app on your mobile phone, say where you need to go, and a robotaxi company will send a nearby vehicle to your location. Companies like Uber give us a taste of that already. It doesn't take too much of vehicle supply to get one to you in just a minute or two -- indeed sub-minute response seems entirely reasonable as a goal. Leaving your office, you might issue a command to summon one that has it there by the time you get to your front door. At home, you might summon one before getting your coat and bags and experience no wait. Great experience, but what's important is that this should usually be a vehicle that is the right vehicle for the trip. If you are going alone across town, it will probably be a small, light, single person electric "pod" car with limited range. That's all you need, because it's going to drop you at your destination and then whisk off to serve somebody else or exchange/charge batteries. Other times you might have a group of people and get a minivan. Or you might have a long drive out of town and ask for a gasoline (or biofuel) powered long-range car. If you need a Hummer or SUV, you could summon that -- though rarer vehicles might need a little bit more advanced notice. This rule -- the right vehicle for the trip -- means that most trips for urban people can be in small, light electric vehicles. Single person vehicles that may be just a few feet wide and can fit two or 1.5 to a lane. Small, light electric vehicles are vastly more energy efficient and less polluting than other cars. You may be surprised to learn that they very handily beat all transit systems in terms of energy used per passenger mile. Everbody thinks electric cars are a great idea, but few drive in them. 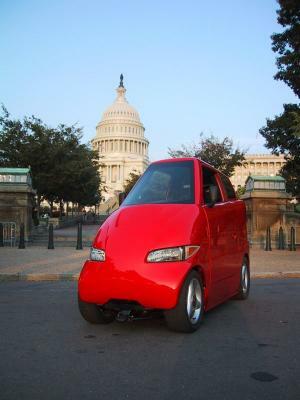 Look at the Tango which is such a car, and costs 1.5 cents/mile for the energy to drive it. This Nissan Leaf and many other cars are on the market, but all the excitement is around the very expenive Tesla Model S -- thanks to its $40,000 battery. But few buy the Tango or Leaf today. People worry about the battery problem in electric cars. You need lots of batteries to get any kind of decent range, and at the end of your range you must spend hours recharging. The batteries are heavy and costly and some suggest they may cause as much pollution as they save. Solving the battery problem is the #1 challenge the electric car industry faces, and it dwarfs the other problems. An electric robocar need not have this problem. All you care is whether it has the range for the trip you're doing now. In fact, having more range just adds needless weight. When it drops you off, it can go somewhere to charge itself. Perhaps it even goes to a special station where other robots exchange the battery cartridge with a fresh one, charged at night when power was cheap. Or perhaps to a super high-current charging station. You don't care, as you aren't waiting. A passenger doesn't care about the range or refueling concerns of a taxi, just whether it will do the job. If you plan a longer range trip, you just get sent a longer range vehicle. Or you go part way in the short range vehicle you have nearby, and then it stops you right next to the vehicle that will take you the rest of your way, and goes off for a charge. For that long trip, you use a liquid fuel (gasoline or biofuel) or hybrid car. With the battery problem solved, electric cars are now the best urban transportation answer, and urban driving is 55% of all driving (Source: EPA). Other clean car technologies are enabled too -- because range, charging and refueling just don't matter as much as they do for a personal car. A move to electric cars (while it will require more power plants) would largely end the importing of oil from overseas nations, since oil is barely used for electric generation. Domestic oil (or future biofuel) should be able to provide for long range trips where electric is not practical. This could mean less conflict in the world. A major move to electric cars would also reduce pollution greatly. Electric generation still pollutes (half of the electricity in the USA comes from coal) but the cars are much more efficient, so the net pollution is quite a bit less, and is moved out of the cities. As we green the grid, the cars get greener. This refers both to CO2 emissions and general pollution, including the particulates that come from liquid fuel vehicles which kill many thousands each year. Of course, for now, robocar development will proceed mostly with gasoline, and electric car development will involve human driving. Later they will have a great marriage. Here are more notes on the battery charging problem. The existence of the robotaxi on demand changes the rules about what car you buy for yourself -- if you buy one at all. Today, many people choose their car to meet almost all their needs. They buy a truck even if they mostly use it as a car. They buy an SUV when they take just a few ski trips per year. They take their minivan all alone to the mall. Almost everybody buys at least a 5 seater car, yet 80% of trips are done alone. If easy robotaxis exist, it lets you buy a car that meets your primary needs rather than all your needs. You buy a car that you like for your personal riding, and you call a robotaxi or robotruck when you need something different. Beyond that, people who today buy 2 cars but really need only 1 and a half may well decide to own only 1 car and hire for their other needs. I suspect that many people will also be interested in hiring out their robocar as a robotaxi when they are not using it. Your car might take you to work, and after it drops you at the door, hire itself out for trips near your office. It might stop doing that when it gets close to your usual exit time, or if it's busy on a job, you can just take a different robotaxi that you hire back. Indeed the robotaxi company you hire out through will probably arrange that at no different cost than going home in your own vehicle. A camera in your car could take a picture of the interior before and after each passenger uses it, so you'll know who trashes the interior, if anybody does. (Passengers will presumably want the camera shut off while they are in it, but that's fine.) This will also detect if people accidentally leave a bag behind. Some people will decide to buy a private vehicle just for themselves, if they feel wealthy enough. Others will find they can afford a better private robocar if they hire it out some of the time -- perhaps only at the higest demand times when prices are high. Others may decide they don't need to own a vehicle at all. And of course, some -- taxi companies -- will own fleets for no other purpose than hiring them out. We can also see a more intense form of personalization when you order a car more than a minute in advance. You can probably order a particular model or even colour of car, or subscribe to a service which offers a style or luxury level you like, and then ride to impress. It is harder to meet the desire many have to keep their "stuff" in their car. I will admit to being one of those, keeping things like a camera and tripod, some books and photographs, maps and even some junk in the back of mine. Of course, millions already live a car-less life (especially in New York and many cities outside the USA) with no ability to keep stuff in their car. I imagine we might create standardized "stuff lockers" which can go in robocars and be easily moved from one car to another. In fact, since we're talking about a world with more advanced robotics, it's not out of the question that robots might automate the transfer. Thus, if you take your car to work and hire it out, first your car would drop off your stuff locker at a depot near your home/office, and fetch it back when coming back to get you. If you take another car, that car could go get your stuff locker. The depot could be accessed by you in the same way you might pop down to your parking garage today to get stuff from the trunk. Finally, the concept of the deliverbot -- a tiny version of a robot truck -- could allow you to fetch your stuff locker even when you're far away, with some delay, if you really need something unique that's in it. As we work towards the robocar world, I also posit an intermediate concept I am calling the "whistlecar." This is a car that you drive, but which is able to deliver itself (with nobody in it) to your location, on demand. Whistle one up (using your cell phone.) This stepping stone to robocars only requires vehicles that can (more slowly) navigate a subset of ordinary streets, and must be able to completely avoid pedestrians, but does not require computerized driving deemed safe enough to transport people. Many of the benefits of robocars I outline could be attained earlier with the whistlecar. I expect the robocar ride to be quite unlike what we're used to in cars. First of all, robocars could receive data broadcasts about traffic light timings and congestion figures (including the number of human driven cars) on all streets. They will pick a route that goes quickly, in perfect sync with the lights, on the best streets for your trip. They will try to give you a trip with very few stops and starts, as well as minimal turns. As time goes on, and human drivers become more rare, the trip will be almost entirely stop free. The vehicle will accelerate gently and rarely change speed, as long as a human driver or pedestrian does not interrupt the flow. A subtle warning about turns or planned accelerations will assure the passengers know to look up from their work or reading to avoid motion sickness. The robocar may also bank and gimbal perfectly into turns for minimal disruption. The robocar will have a suspension quite unlike a human driven car. Human drivers demand a tight suspension that lets them feel the road. A robocar suspension will be soft and smooth. Quite possibly it will be dynamic, using ferofluid shocks which computer adjust to bumps. The robocar may even laser-scan the road surface ahead of the vehicle to spot potholes and bumps before they encounter the wheels, or receive detailed maps of such things from other cars that drove the road just seconds before. As unconnected cars diminish, congestion will also vastly diminish. Robocars, identifying other robocars on the road, can space themselves more closely, and react at machine speed to anything unexpected. Single person robocars will be able to pack 3 to 4 times more densely than traditional human driven sedans. Robocars could be allowed without problem in private right-of-ways designed for BRT. All in all, the trip will eventually be faster than any other option. (If you want to see something that's theoretically possible in an all robocar world, but probably too frightening, try this site on reservation systems and its old simulator applet, especially the 6-lane version.) A less frightening, but more physically jarring approach would be a robocar roundabout. Cars requesting reserved slots in the roundabout could pace themselves to enter the roundabout with minimal slowing. All this might eventually generate a ride as nice as a train or a plane in clear air. Compared to a trip in a private car, or a trip on transit, it should be superior in every way. Almost all other proposals in transportation -- new subways, light rail, personal rapid transit, bus rapid transit and carpool lanes -- require the building of new infrastructure, usually at astonishingly large financial and social cost. In the San Francisco Bay Area, new BART lines -- our fancy subway-like train -- have come in at over 200 million dollars per mile. In extreme cases costs have reached close to a billion per mile. The public doesn't want to know what that ends up costing per rider. Robocars make use of the existing infrastructure. In theory no new infrastructure or public investment is needed, except a few minor and inexpensive improvements like traffic signal broadcasting, traffic-data and possibly reservations for crowded roads would help a little. Robocars will effectively be financed entirely by the private sector. Individuals will buy their own robocars. Profitable taxi companies and individuals will hire them out to the public. In theory, this could all happen with few public dimes beyond the DARPA prize funds -- and the existing road maintenance budgets. Any computer technology -- including the software in a robocar -- becomes obsolete far faster than we are accustomed to predicting. To adapt to the rushing pace of information technology, you need something that's distributed among the people, who buy innovations one by one in a competitive market. Governments plan things over decades, and buy with billion dollar budgets. City transit planners are extremely conservative in their choices, often buying 19th century technology even today. They don't adapt to rapidly changing technology. Bottom-up innovation, bought by individuals beats central planning. Every time -- and nowhere more dramatically than in computer technology. By making the computer the central part of the car, robocars bring Moore's law to transportation. Moore's law works when technology is bought by people known as "early adopters." These are rich technophiles who will jump at the latest cool thing, ready to waste money on it. Then they switch next year to the new cool thing, and the next wave of adopters moves in. This drives innovation at a breakneck pace never seen in transit, which is bought by risk-averse city councils will multi-decade ammortization schedules. In the more distant future, robocars will generate massive savings in public infrastructure, by reducing need for roads, overpasses and dedicated transit rights-of-way or entire transit systems. In theory, robotrucks could be made smaller, lighter and longer to vastly reduce road wear, maintenance and construction costs. The numbers about the efficiency of U.S. transit systems will depress you. It's not hard to be greener than U.S. transit, and lightweight single person electric vehicles can be 5 to 10 times more efficient, in energy per passenger mile, than anything else out there, including transit. We're talking as much as 400 miles per gallon equivalent. As such, I believe robocars will combine all the advantages of private cars and all the advantages of transit. As such, the role of urban mass transit will be seriously rewritten. To learn more, read the sidebar on the end of transit which also contains some hope for what it might become. You'll also see some very surprising charts on the energy efficiency of various modes of transportation. Perhaps at this point you agree this all sounds wonderful. And given that a million more will die for every year we delay full deployment of this, how do we make it happen, and what are the barriers? Read on for part two: The Roadmap to Robocars. Read and leave comments on this page. In addition, you can read and subscribe to the Robocars section of my blog.